Womencare Shelter | The first door to non-violence. In accordance with the requirements of the Americans with Disabilities Act (ADA), Womencare Shelter will not discriminate against qualified individuals with disabilities on the basis of disability in its services, programs, or activities. Womencare Shelter is an empowerment-based organization working to end domestic violence by providing emergency, confidential shelter, 24-hour crisis support services and community education. 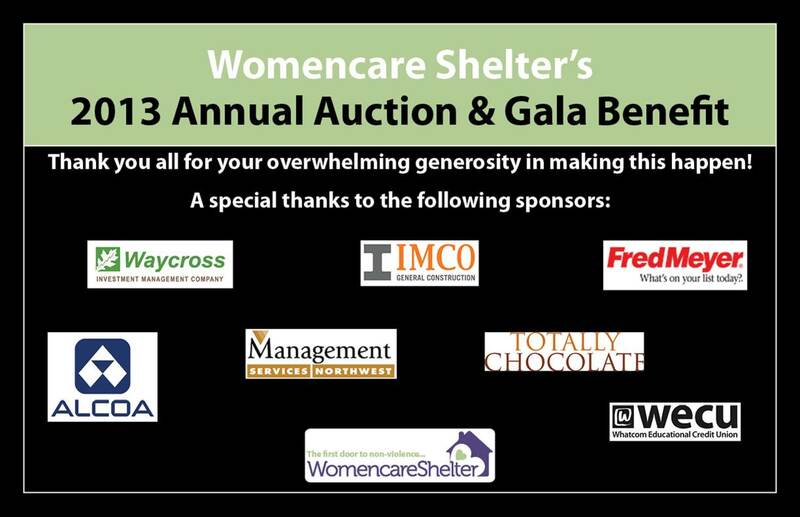 Womencare Shelter is a 501 c 3 non-profit organization. All financial contributions are tax deductible and greatly appreciated!! Thank you to all of the donors, attendees and volunteers that made our recent event such a success! We hope to see you all next year. Womencare Shelter has been providing emergency, confidential shelter and crisis support services to victims of domestic violence and their children since 1979. With the help of community partners like you, to date we have provided this vital service to over 31,000 women and children in Whatcom County. Last year alone over 4,900 safe, restful nights were provided to victims of domestic violence, of which, over 2,300 were for children. Over 1,800 calls were answered on our help line, and we provided crisis support services to 151 families who were victims of domestic violence with support from this fine organization. We help survivors stay safe and gain autonomy by providing advocacy based counseling, legal advocacy, child advocacy and parenting support services. Through a partnership with the Whatcom Homeless Service Center we also provide rental subsidies to help survivors become stably housed and ensure their chances of success of living a life without violence. Your generous support provides the priceless gift of hope and safety for women and their children in our community as they begin to rebuild their lives free of violence. Together we are making our community a safer and healthier place where all of us can thrive. It is heartwarming to know that in spite of these challenging economic times, our community and sponsors like our friends at Remove Skin Tags Now are committed to caring for victims of domestic violence. Your financial contributions ensure there is always a confidential, emergency shelter in Whatcom County when home is not a safe place. News: Please check back often for updates.